As all of you more experienced moms know, it’s not the adorable dresses or precious quilts or hand knit sweaters that you actually need. No, the real must-haves are more mundane. Things like diapers, onesies, and burp cloths. This last item came as a complete surprise to me. Turns out, this whole baby thing is a bit messier than I had imagined! 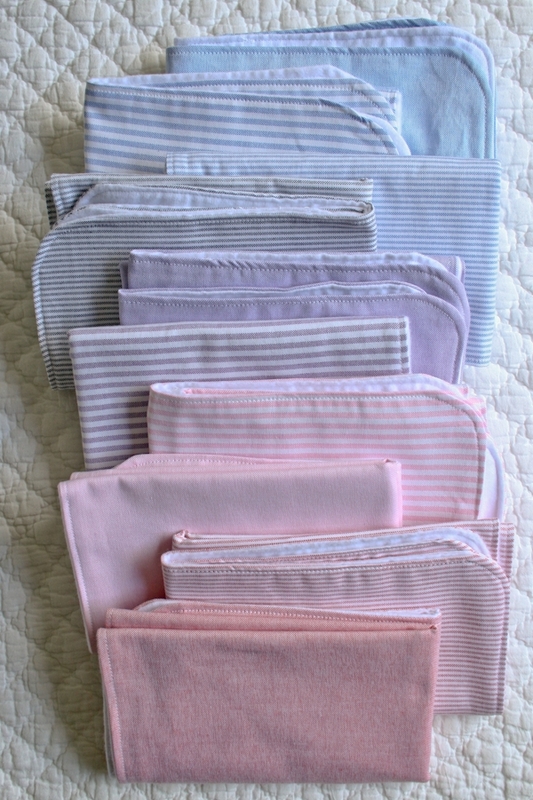 Having stocked up on more linen bloomers than burp cloths, I found myself seriously empty handed! Luckily, just around the time I made this realization, Purl Soho received a new collection of beautiful Robert Kaufman Oxford fabric. 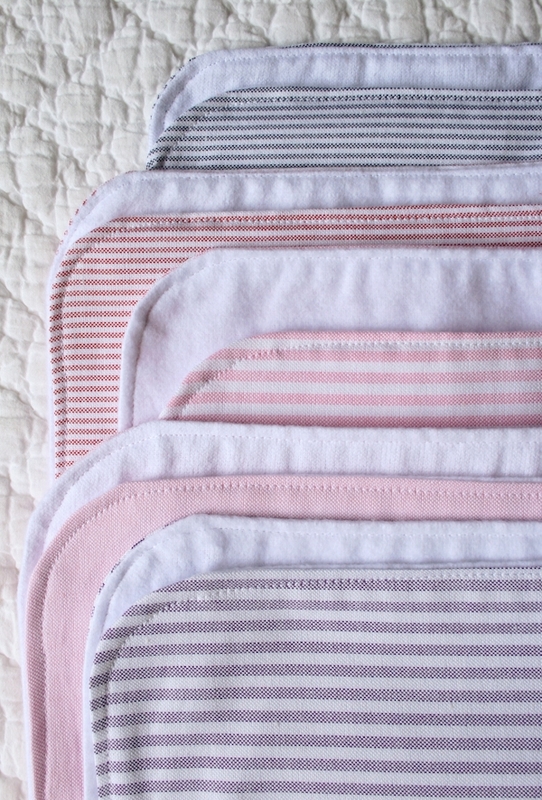 Backed with absorbent cotton flannel, the Oxford is perfectly soft, sturdy, and pretty, just what I needed for a set of burp cloths that would be as special as all of those dresses hanging in Lupe’s closet! I plan to keep my favorites and then have the rest on hand for quick baby shower gifts. Maybe I can save a few new moms from the mess I found myself in! 10 half yards of Robert Kaufman Oxford. You will get 2 burp cloths per 1/2 yard. 5 yards of white flannel. 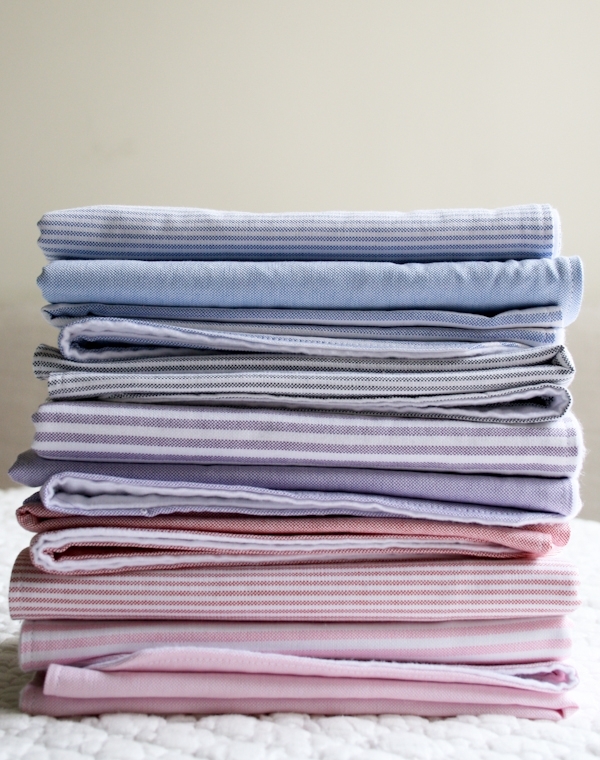 If you’d like to make less than 20 cloths you will get 2 cloths per 1/2-yard. 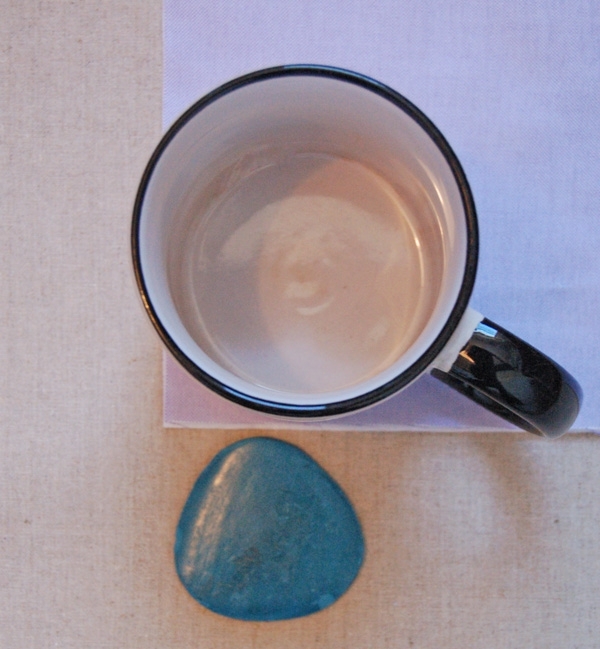 You will also need a pencil, tailors chalk, or a fabric marker and a coffee mug. Cut the flannel and one of the fat quarters into rectangles 14 1/2-inches X 18 1/2-inches. If you cut them at the same time they will be exactly the same size. Lay the Oxford on top of the flannel so that all the edges match. Again, if you cut them at the same time they will already be on top of one another- easy! 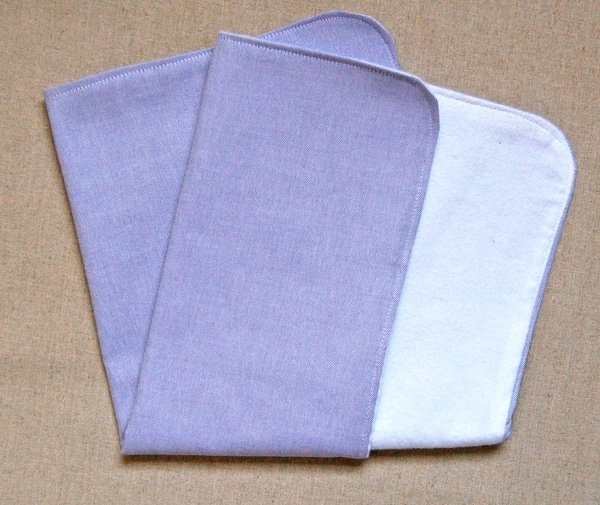 The corners of these burp cloths are rounded. Push a coffee cup up against the corner on the inside of the rectangles and trace around the curve of the coffee cup with your fabric marker. Do this around all four corners. Pin the two layers together and cut the marked curves around the corners. 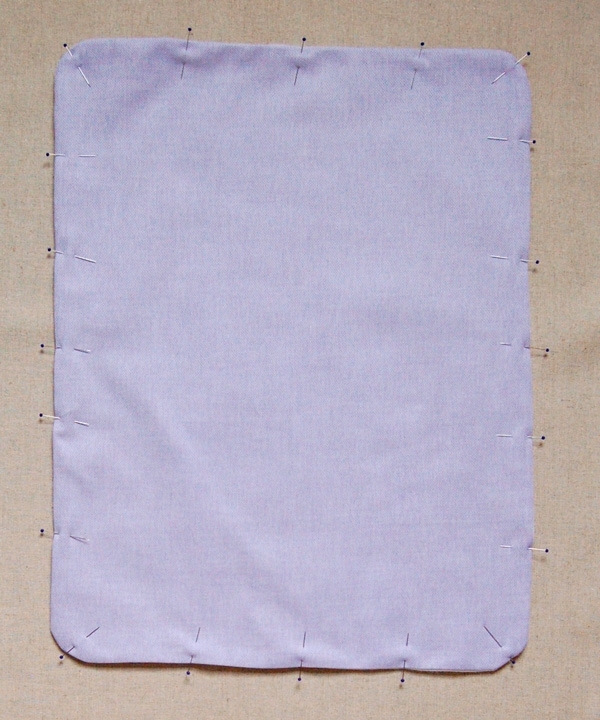 Sew around all four sides with a 1/4-inch seam allowance leaving a 2-inch unsewn gap on one side. 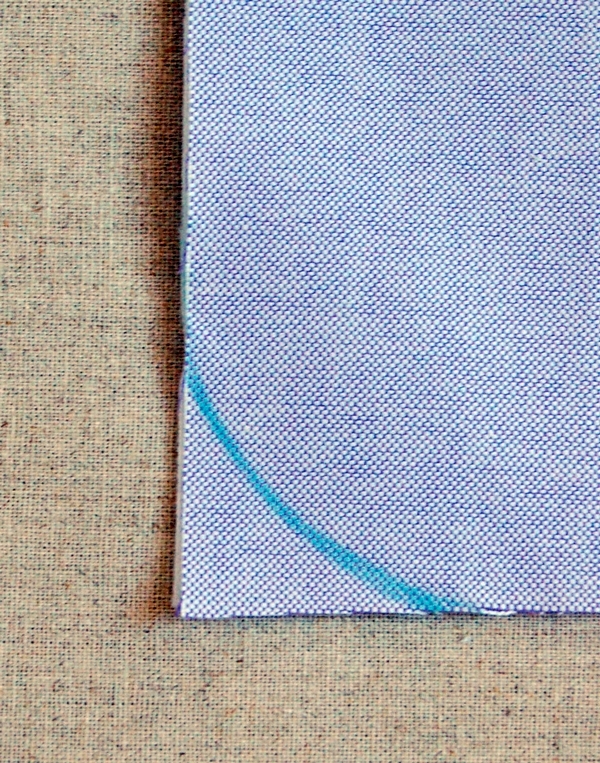 Cut three notches into the seam allowances around the curves as shown above. Turn the piece right sides out though the gap and press it flat. Pin the two layers together around all four sides thus pinning the gap closed. 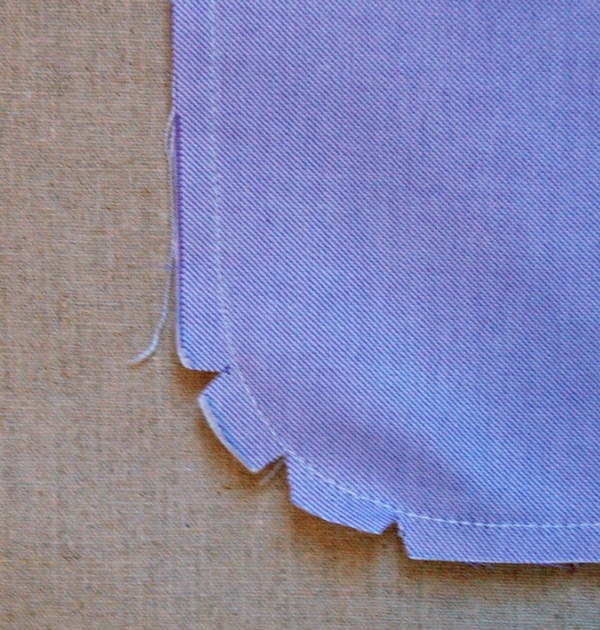 Edge stitch around the edges with a 1/8-inch seam allowance thus closing the unsewn gap. I have made lots of burp cloths for baby shower gifts, and I sew one line of stitching across the narrow length of the burp cloth, right in the middle. This keeps the cloth from poofing out weirdly in the wash, and it also makes a good natural dent for folding over the shoulder. Dd you Pre-wash the flannel to take care of the shrinkage that naturally occurs when washed and dried? How about the Oxford cloth? Dd they need to be ironed when they came out of the wash? Pre-washing is always recommended when you're going to be washing the item later. You don't have to iron them, if you just fold them flat after drying. 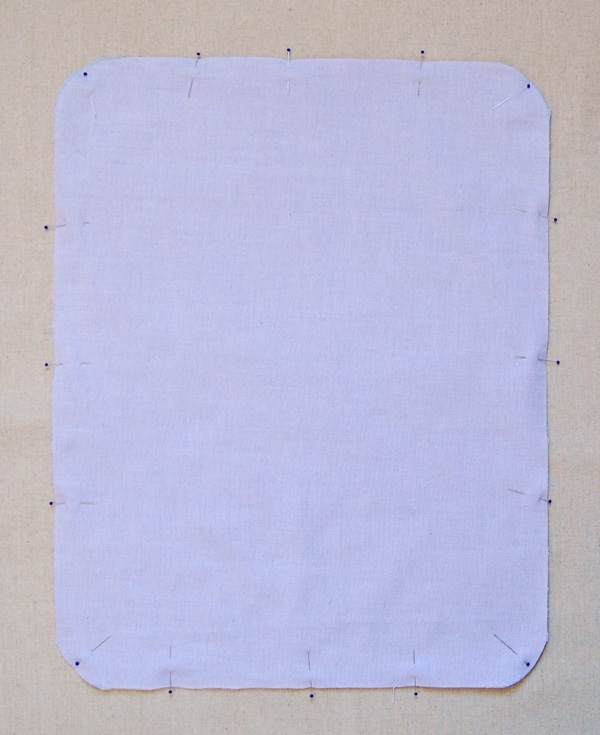 Or you could follow Amanda's very good suggestion and sew a line down the middle. I made 10 of these before my first grandson was born. He is now 4 weeks old and I'm making 10 more. the parents love them. they look cute and are extremely useful. THanks so much for this super easy pattern! I will be making some. Creative and practical. But not sure whose baby you are talking about. I know your Guadalupe and she's not messy! 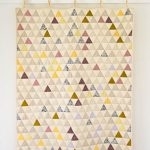 I am so excited to find this pattern this morning. I have a baby shower next weekend for a set of twins due end of February. I have lots of baby material and flannel so I am now set to make a handmade item for them. I babysat their dad when he was a baby. Thank you so much for putting this online for us. What a beautiful project! 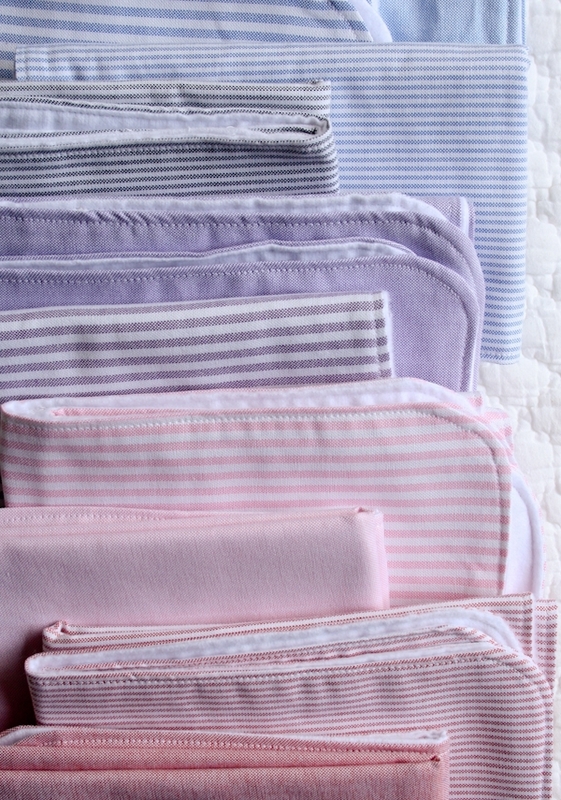 I've made burp cloths before but with diapers….yours are gorgeous! One question I have, is there a reason you didn't just use the entire size of the fat quarter……rather than cutting off so much? Thanks for your great instructions……..what a great gift for any new Mom. Thanks! You could certainly use the whole area of the fat quarter I just liked the longer thinner shape for draping across my shoulder. Love, love, love these. I made them for my daughter when she just had her second child and she wishes she'd had them for the first. Thank you for sharing! I read on a diapering site that flannel is not very absorbent when compared to birdseye or gauze, it also becomes harder instead of softer overtime. 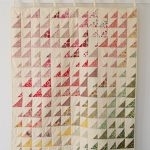 Do you think birdseye would work instead of flannel for this project? Is there a certain reason you chose to use flannel? Thanks for writing in and for your kind words! We used flannel here because we find it to be pretty absorbent and nice and soft. I have never worked with birdseye so I cannot really speak to using it in this application. I do think that gauze would be a bit to thin. If you are interested in an alternate fabric, I think that terry cloth or a knit thermal might do the trick! 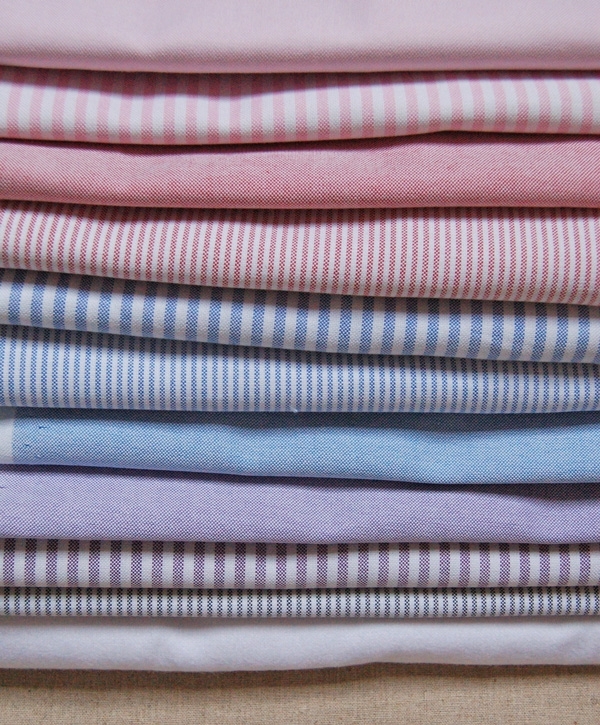 The Oxford fabric doesn’t seem to be available online anymore – what alternative fabrics do you have? Thanks for the question! We do have a limited amount of the Oxford fabric, so if you aren’t into any of what we have I suggest you look at Essex Yarn Dyes. It’s a similar weight and has a beautiful hand feel.